For me, this is THE bed. The bed that now I've seen it, I will dream about until it's mine. Such a simple design and something my boyfriend has claimed that he could easily make- we will be putting that statement into action in the future! I love the raw birch branches used and how they are tied with rope. I think I would maybe use coloured rope to make more of a statement. 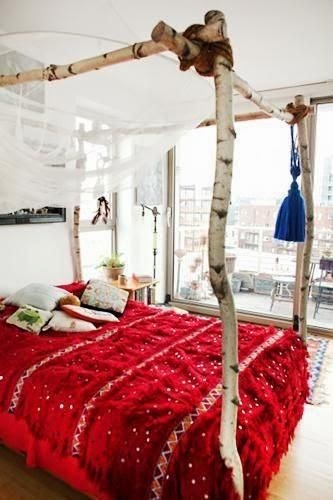 But thats whats great about this bed, you can easily use different wood and ties to customise it to your own bedroom; hanging curtains from it, winding fairy lights around the posts, decorating the wood with different materials or however else.